All PC servers will be taken offline for an update at 6 AM PT on Thursday, February 8th, 2018. “This is not a decision we take lightly, we know now that travel through these unstable warpgates leads to abnormal behaviors and higher rates of pattern incoherence syndrome. The Unstable Warpgates system is here! Newly opened continents will be put in an “unstable” state where the majority of territories will remain offline until population reaches a certain threshold. For the time being, Unstable continents will also automatically go online after two hours so that off-peak times of day still have an opportunity to rotate the continent. Meltdown alerts cannot be triggered, meaning that the continent cannot be locked in this state. Many regions become disconnected from the lattice and made uncapturable. Disabled regions can still be traversed, and the terminals remain hackable. A population of more than 96 players will cause the Warpgates to stabilize. These regions will also automatically stabilize after two-hours unstable. This functionality may change in the future. Increase fight density on off continents, or during off-peak hours. Mitigate the “free” Meltdown wins taking place on off continents. Give players in queue for main continents an alternative to waiting in VR zones. The continent of Koltyr has been re-purposed as a VR training area where players of all factions can join in and test weapons and equipment on one another in a casual environment that doesn’t record statistics. Players can reach Koltyr VR from the world map screen, or through a Warp Gate Terminal. VR loadouts are used, meaning all weapons and equipment are at max level, unlocked, and do not need to be purchased for use. Up to 33 players on each of the three factions (99 total players) can make use of this continent. Up to two instances of Koltyr can exist at any time currently. Flash, Sunderer, and Lightning are the only available ground vehicles. 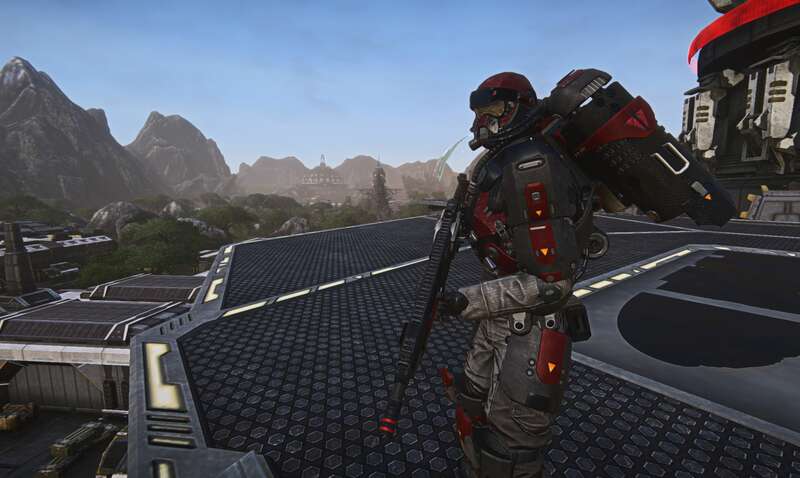 Three new vehicle-capturable bases have been added to Esamir and Indar, and two additional vehicle-capturable bases have been added to Amerish. These open-areas contain a single capture point, and can be fortified with construction objects to create a fortress of your own design. In addition to the new base areas, we’ve made adjustments to some base capture points and lattice connections to reduce map stagnation and increase lane flexibility. (New) Sunken Relay Station has lattice links to Howling Pass and Mao Watchtower. Removed the lattice link from Howling Pass to Mao Watchtower. (New) Berjess Checkpoint has lattice links to Regent Rock Garrison and Scarred Mesa Skydock. Removed the lattice link from Regent Rock Garrison to Scarred Mesa Skydock. (New) Lowlands Trading Post has lattice links to Indar Excavation and Quartz Ridge Camp. Removed the lattice link from Indar Excavation to Quartz Ridge Camp. Removed the construction no-deploy zone from where the Abandoned NS Offices used to be. (New) Solus Nature Annex has lattice links to Xelas North Gate and Silver Valley Arsenal. Removed the lattice link from Xelas North Gate and Silver Valley Arsenal. (New) Cobalt Geological Outpost has links to Cobalt Communications, West Pass Watchtower, and The Scarfield Reliquary. Removed the lattice link from Cobalt Communications and West Pass Watchtower. Lith Corps. Central, expanded Sunderer and Construction no-deploy zones. Adjusted some BioLab capture point building geometry. Sungrey West Gate received more spawn room cover. (New) Tapp Waystation has lattice links to Andvari Frozen Reservoir and Pale Canyon Chemical. Removed a lattice link from Andvari Frozen Reservoir and Pale Canyon Chemical. (New) BL-4 Recovery Point has lattice links to East River Sky Station and Terran BL-4 Crash Site. Removed the lattice link between East River Sky Station and Terran BL-4 Crash Site. (New) Untapped Reservoir has lattice links to Rime Analytics and Mattherson’s Triumph. Removed the lattice link between Mattherson’s Triumph and Untapped Reservoir. Added a lattice link from Mani Fortress to Mani Tower. Added a lattice link from Mani Tower to Mani Lake Satellite. Added a lattice link from Andvari Barracks to Andvari Frozen Reservoir. Added a lattice link from Andvari Frozen Reservoir to Andvari South Bank. Added a lattice link from Ymir Southern Reach to Ymir Mine Watch. Added a lattice link from Ymir Mine Watch to Ymir Eastern Way Station. Echo Valley Substation now has a lattice link to Nott Communications. Apex Genetics now has a lattice link to Rime Analytics. Removed a lattice link between Rime Analytics and Saerro Listening Post. East River Sky Station, expanded Sunderer No-Deploy Zone. Saerro Listening Post, [A] point has been moved out of the tower and converted into a vehicle capture point east of the base. The Traverse, [A] point is now a vehicle capturable point. The next batch of empire specific weapons, designed by D0ku, have been released to the public. You’ll find three new LMGs in the Depot, as well as Fully Loaded bundles for each. 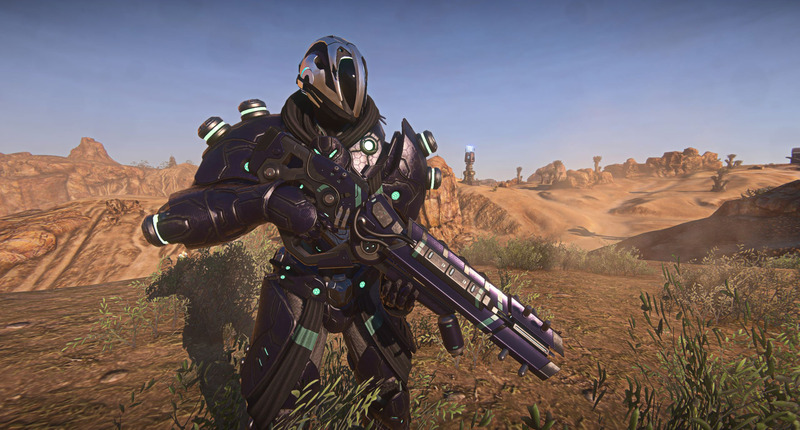 The newly developed Maw LMG provides Vanu soldiers with a decisive mix of reload speed and stopping power, thanks to advances in cooling techniques. It’s equipped with a 60 round magazine that fires 167 damage projectiles at 600 rounds per minute. Designed with sustained fire in mind, the Promise LMG is an accurate, high rate of fire weapon without a harsh penalty for laying on the trigger. It’s equipped with a 100 round magazine that fires 143 damage projectiles at 698 rounds per minute. With the highest rate of fire of any light machine gun, the Watchman excels in sending metal down range, and its large magazine size ensures you have enough lead to share. It’s equipped with a 125 round magazine that fires 125 damage projectiles at 857 rounds per minute. Unstable Ammunition no longer penalizes cone of fire. 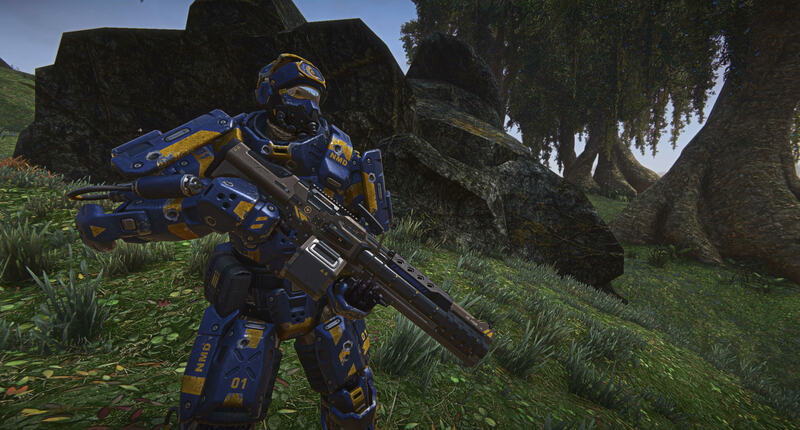 Dev Note: The baseline rate of fire increase helps push Canis into a more competitive position. Unstable Ammunition dropped the cone of fire penalty, as the more recent headshot multiplier reduction was sufficient to balance out the power of the attachment. Base projectile velocity from 350 to 400. Suppressed audio now uses the correct rate of fire. BX Adapter received an updated tooltip. BX Adapter no longer reduces ammo capacity. BX Adapter can no longer be equipped at the same time as the Hybrid Suppressor. Dev Note: We decided to keep the BX Adapter a niche attachment while fixing some quality of life issues it created. The velocity increase helps the weapon play more nicely with Hybrid Suppressor, and complements the accuracy focus of the base weapon. Default magazine size from 28 to 26. Ammo capacity from 168 to 182. Dev Note: This weapon was mostly where we wanted it to be, but needed a bit of tuning in the damage per magazine department. The mag size reduction removes some of that damage per magazine, while still keeping it between an unmodified Cyclone and the Blitz SMG. The magazine reduction indirectly creates a more substantial tradeoff for the SPRW attachment as well. Removed braking penalty on Racer chassis. Dev Note: The previous brake reduction was causing issues with the lateral friction while moving over hills and rough terrain. This change makes the vehicle easier to control all around. Dev Note: Adjustment based on player feedback to help reel in some of the Scythe's strength against other ESF with the default weapon. Added the Lockon Jamming Field defensive slot. While equipped, the Lockon Jamming Field will passively protect allied vehicles from lockon attempts and proximity-based lockons, but not the galaxy itself. Dev Note: The addition of this defense slot opens a new route for support capabilities when accompanied by allied vehicles faced with the specific threat of lock-on or proximity-lock projectiles from ground or air. Vehicles are still susceptible to flak while this affect is active. This ability will receive a new mini-map icon, similar to Proximity Repair or Ammunition Galaxies as well as new visual FX, in a later update. Increased the maximum range of the Galaxy’s proximity repair for air vehicles from 50m to 75m. Updated the tooltips to better describe the repair rate and distances. The Galaxy’s vehicle ammo dispenser no longer has different resupply ranges for air and ground vehicles. The ranges have received a slight increase, and now affect all vehicle types equally. Rank 1: 50/40m for air/ground to 50m for all vehicles. Rank 3: 80/70m for air/ground to 90m for all vehicles. Rank 4: 95/85m for air/ground to 100m for all vehicles. No longer takes up the utility slot, and has been integrated into the vehicle. This skill line can now be upgraded from the Passive Certs area of the vehicle. The regeneration rate of the default afterburner is 40 seconds. The first rank of the passive cert line now reduces the regeneration rate to 30 seconds. Corrected an incorrect tooltip in rank 4. Certification cost from 250/375/550/750/1000 to 100/150/200/400/1000. Dev Note: Afterburner has been best-in-slot on the Liberator for as long as it has existed. With the recent pivot to a more sustained fire role, the value of fire suppression and flares has been increased, but the trade for afterburner remained too high. A default afterburner should make the vehicle more enjoyable to fly, add more flexibility for which engagements it can participate in, and lower the cert investment for players looking to make use of the Liberator. Dev Note: This change is primarily intended to reward aim against light-armored targets, like ESF and Harasser, moving the shots to burn/kill from 5/6 to 3/4 for ESF and from 7/8 to 4/5 for Harasser. Dev Note: In most cases, this reduces the number of main cannon shots to kill a Harasser by one. 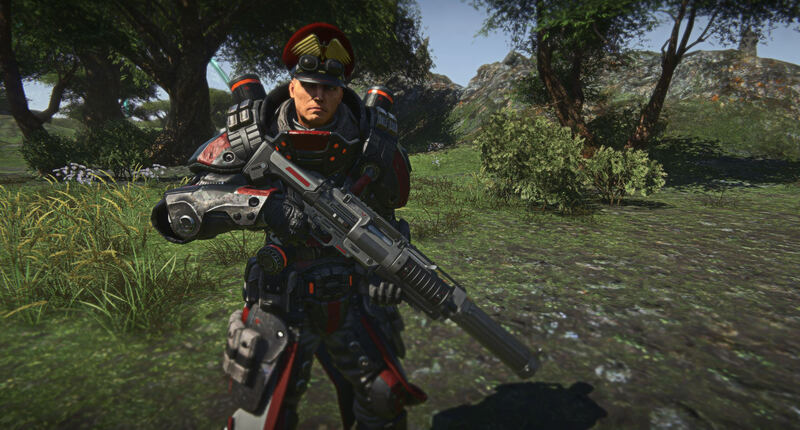 Fuzzbuket’s Arbiter Helmet and Armor set (Terran Republic) can now be found bundled in the Depot. Fixed a bug where remote clients would see players replay their firing animation after reloading a burst weapon. Fixed a bug with players being ejected from squad-spawned vehicles whose pilot is not the owner of the vehicle. A Join Combat prompt will appear for idle players below BR20, encouraging them to join the fight. You should no longer see padlocks over capture points while in an enemy territory that is connected to another enemy territory. Removed the wildly inaccurate queue timer from continent queue UI. Removed server population indicators on character creation. Wielded knives should no longer break when entering or exiting a vehicle. Bastion fleet carrier received a makeover, and is still a work in progress. The /squad promoteme command now provides a more descriptive prompt. Added various messaging for squad actions when promoting or petitioning players. Bounties have been disabled in VR training zones. Speculative fix for newly opened servers setting correct continent control. Tank Mine responsiveness fix pushed to Live. It was missed in the last update, and remained on PTS. This is unlikely to fix server/client issues, but they should still function more smoothly in more situations. Modified reward messaging during a Meltdown alert. Modified forward grip position for Canis SMG. Modified description for NC6 Gauss SAW and LA1 Anchor. Solid Dark Green Camo icon should now more accurately represent the color of the camo. Nanoweave Armor no longer prevents Resist Shield from protecting against headshot damage. Mini-map UI population chart properly reflects faction color settings.